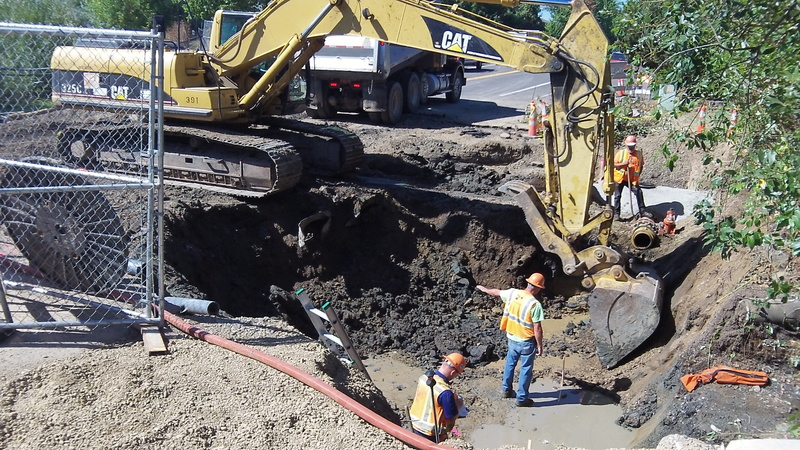 There was a big, deep hole Wednesday on Belmont Street in southwest Albany, and workers were laboring to make it bigger. Working under a $484100 city contract, North Santiam Paving of Stayton is replacing two damaged culverts under the street with a three-sided box culvert, and until it’s done the street is closed. You may have read about this project here before, the last time in May after bids were opened. High water had damaged the culverts and undermined the street in January 2012. The street was reopened quickly, but the need for permanent repairs under a $700,000 FEMA grant turned this project into a prolonged exercise in navigating various bureaucracies to secure the necessary permits. “Last week was the first week the city’s contractor was on the job. Considering it was a short week a lot has actually taken place. However, when you stopped by that work would not have been visible or apparent to you. “Earlier in the week the sewer line that runs under/through the culvert was lined with a brand new pipe to protect it during construction. On Thursday, when you stopped by, the contactor had exposed the waterline to ensure that they were ready for the coming night work. They were back to work at 9 p.m. and finished that water line work at 2 a.m.
“The night work on the water line was necessary to avoid interruption of the water services to the business in the area during peak business hours. On Friday they completed the remainder of that preparation work, which will now allow them to remove the water line to make way for the new culvert.